Real life has a close competitor in the “Art Project,” released by Google last week. Their initial release is a clean, inviting site for browsing over one thousand artworks from 17 of the world’s most famous museums. At least one piece from each of the 17 museums is displayed in gigapixel resolution, so that online visitors can zoom in to the brushstrokes. Each piece also has information about the artists, text or video commentary, bios, and links to related pieces. Some museums have 3D walk-throughs, analogous to Google’s map street views (there are 6000 3D panoramas), and there’s a way to create personal art “collections” to revisit or share later. 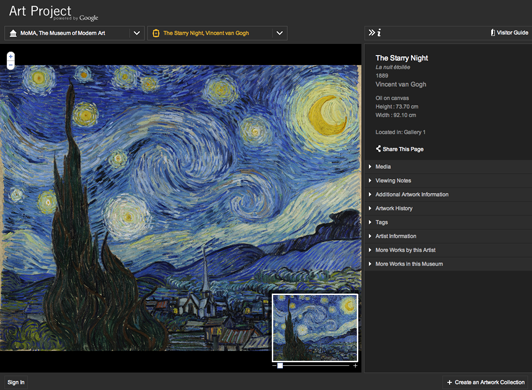 The Starry Night image in the Google Art Project is super high resolution. The Google image is approximately 45 thousand pixels wide. It is 6 times higher resolution than the naked eye can see from a meter. The painting is 74 cm × 92 cm. The maximum spatial resolution of the human eye is measured in cycles per degree. If we consider the vision photoreceptors in the eye to be analogous to pixels, our vision in the most sensitive region, in the fovea of our eye, corresponds to the equivalent pixel spacing of 0.39 arc-minute (Clark, 1990). One degree of vision is 1 / ( 0.39 * 1/60) = 154 pixels. 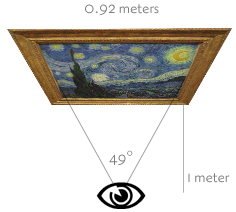 If you stand one meter from a painting, a 0.92 meter wide painting uses a width of 2 * arctan ( 0.92 / 2 ) degrees = 49° of your vision. The equivalent number of pixels which you can see is = 49 * 154 = 7546 pixel wide — the limit of resolution of our eye — any higher pixel density would look the same. You would need to look at the painting with your eye 7 cm (just under 3 inches) away to see the same level of detail. Brian Croxall notes that this is much higher resolution than the commercial image library ARTstor gives to schools and libraries. Seeing details is important, but the relative importance of seeing detail vs. seeing real 3D is debatable. An article in the Washington Post, reported skeptical comments from museum directors, for example, Brian Kennedy, director of the Toledo Museum of Art in Ohio, said the gigapixel images can bring out details that might not be visible to ordinary museum-goers in a gallery. But scholars will still want a three-dimensional view of the art, which even a very high-resolution two-dimensional image can’t provide. In any event, the degree of access in this visually appealing, easy to use, highly publicized and free web site is unparalleled. Without it, images of this iconic painting are hard for the general public to appreciate in detail, unless they buy a (two-dimensional) poster or book. That painting is located at MoMA in midtown Manhattan. Admission to the MoMA costs $20 for adults, $12 for students, and free on Friday nights. 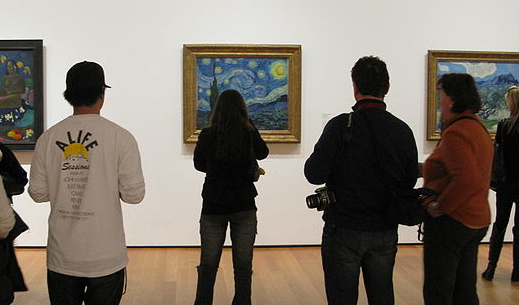 MoMA has approximately 2.1 million visitors per year, averaging 6.7 thousand visitors per day they are open — 16 visitors per minute — many of whom are interested in the same famous van Gogh painting. Despite being painted in 1889, and long since out of copyright, MoMA maintains strict control over photos which visitors might want to take home or share. According to their guidelines: “Still photography for personal use is permitted in collection galleries only… No photographs or videotapes may be reproduced, distributed, or sold without permission from the Museum.” — All the more reason that MoMA and the other 17 museums are to be commended for facilitating this project. …process reproduction is more independent of the original than manual reproduction. For example, in photography, process reproduction can bring out those aspects of the original that are unattainable to the naked eye yet accessible to the lens, which is adjustable and chooses its angle at will. And photographic reproduction, with the aid of certain processes, such as enlargement or slow motion, can capture images which escape natural vision. Elizabeth Merritt, founding director of AAM’s Center for the Future of Museums, called the walk-through technology an interesting experiment, and the kind of experiment that most museums can’t produce on their limited budgets. She liked the personalization, citing that “It certainly fits with the research we’ve been doing that people like to create their own experiences and their own mash-ups and share them with other people,” but she questioned the appeal of looking at art and galleries on a computer screen. Marsha Semmel, deputy director for museums at the Institute of Museum and Library Services, said in the Post article that online collections should strive to create connections between material held by different institutions. Check out the van Gogh painting at Google Art Project. IDEA » Kids can make great online history exhibits cheap. Can museums?